PARIS: French ex-president Nicolas Sarkozy was detained for questioning yesterday over allegations that late Libyan dictator Muammar Gaddafi financed his 2007 election campaign, including with suitcases stuffed with cash, a source close to the inquiry said. Sarkozy was taken into police custody yesterday morning and was being questioned by officers specializing in corruption, money laundering and tax evasion at their office in the western Parisian suburb of Nanterre. The 63-year-old had until now refused to respond to a summons for questioning in France’s most explosive political financing scandal, one of several legal probes that have dogged the right-winger since he left office after one term in 2012. Sarkozy’s detention was first reported by the Mediapart investigative news site and French daily Le Monde. AFP’s source said that Brice Hortefeux, a close ally who served as a senior minister during Sarkozy’s presidency, was also questioned Tuesday as part of the inquiry. Since 2013, investigating magistrates have been probing media reports, as well as statements by Gaddafi’s son Seif al-Islam, that claimed funds were provided for Sarkozy’s first tilt at the presidency. “Sarkozy must first give back the money he took from Libya to finance his electoral campaign,” Seif told the Euronews network in 2011 as NATO-backed forces were driving his father out of power. Sarkozy has dismissed the allegations as the rantings of vindictive Libyan regime members who were furious over France’s military intervention in Libya that helped end Gaddafi’s 41-year rule and led to his death. He has also sued Mediapart, which has driven media coverage of the Libyan allegations since 2012 when it published a document allegedly signed by Libya’s intelligence chief showing that Kadhafi had agreed to fund Sarkozy to the tune of 50 million euros ($62 million). The case drew heightened scrutiny in November 2016 when a Franco-Lebanese businessman admitted delivering three cash-stuffed suitcases from the Libyan leader in 2006 and 2007 as contributions towards Sarkozy’s first presidential run. In an interview, again with Mediapart, Ziad Takieddine claimed he dropped 1.5 to 2 million euros in 200-euro and 500-euro notes each time and was given the money by Gadhafi’s military intelligence chief Abdallah Senussi. When asked about the allegations during a televised debate in 2016, Sarkozy called the question “disgraceful” and said the businessman was a “liar” who had been convicted “countless times for defamation”. The legal investigation is looking into these allegations, as well as a 500,000-euro foreign cash transfer to Sarkozy ally Claude Gueant, and the sale of a luxury villa in 2009 in the south of France to a Libyan investment fund for an allegedly inflated price. Sarkozy, the son of a Hungarian immigrant father who takes a hard line on Islam and French identity, was nicknamed the “bling-bling” president during his time in office for his flashy displays of wealth. He failed with a bid to run again for president in November 2016 and has stepped back from frontline politics since then, though he remains a powerful figure behind the scenes at the rightwing Republicans party. 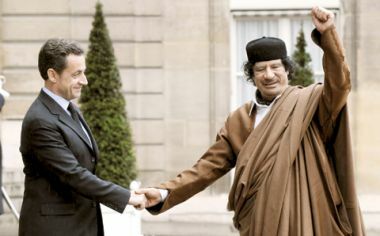 Seven months after his 2007 presidential victory, Sarkozy invited Gaddafi to Paris and clinched major arms and nuclear energy sales to the oil-rich north African country, which has since descended into civil war. The Libyan autocrat was allowed to pitch his Bedouin-style tent on a lawn in central Paris and attended a dinner at the presidential palace, which was boycotted by several of Sarkozy’s ministers. It is not the first time that Sarkozy has been detained: he became the first French president to enter police custody in July 2014 over a separate inquiry into claims that he tried to interfere in one of the several investigations targeting him. He was taken into custody on Tuesday after another former associate, Swiss businessman Alexandre Djouhri, was arrested in London in January. Investigating magistrates have recommended Sarkozy face trial on separate charges of illegal campaign financing over his failed 2012 re-election bid. The prosecution claims Sarkozy spent nearly double the legal limit of 22.5 million euros ($24 million) on his lavish campaign, using false billing from a public relations firm called Bygmalion. He faces up to a year in prison and a fine of 3,750 euros if convicted, but he is appealing the decision to send him to trial, claiming he knew nothing about the fraudulent practices that Bygmalion executives have admitted to. Only one other French president-Jacques Chirac-has been tried in France’s Fifth Republic, which was founded in 1958. He was given a two-year suspended jail term in 2011 over a fake jobs scandal.